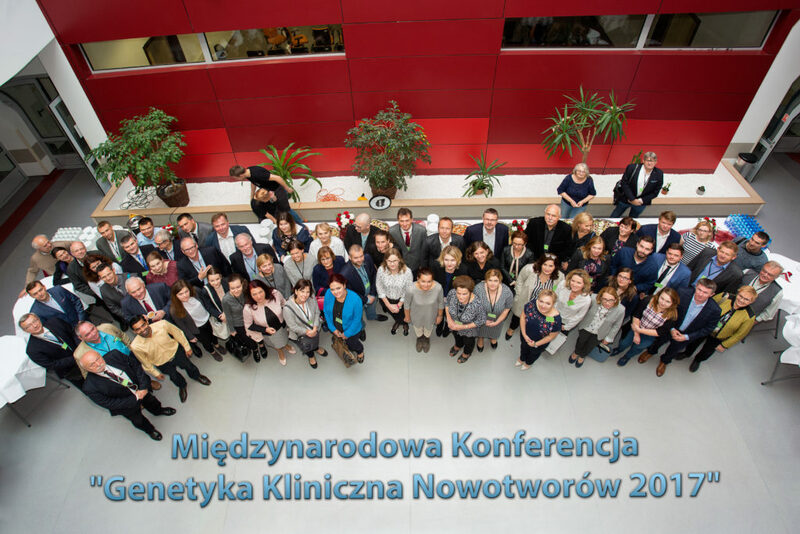 Międzynarodowa Konferencja „Genetyka Kliniczna Nowotworów 2017” – zadanie finansowane w ramach umowy 811/P-DUN/2017 ze środków Ministra Nauki i Szkolnictwa Wyższego przeznaczonych na działalność upowszechniająca naukę. 1. GENETICS OF FAMILIAL CANCER. 2. INHERITED MUTATIONS OF PALB2 GENE AND BREAST CANCER. 3. MULTI-CANCER GENE PANEL TESTING IN 1255 DUTCH FAMILIAL CANCER PATIENTS:SINGLE NUCLEOTIDE AND COPY NUMBER VARIANT ANALYSIS. 4. Evolution of BRCA-associated tumors during therapy: from sensitivity to resistance. 5. RESULTS OF CIS-PLATINUM TREATMENT OF BREAST CANCER PATIENTS WITH BRCA1 MUTATION. 6. Hereditary breast and ovarian cancers – advances in DNA testing. 7. RELATIVELY HIGH INCIDENCE OF NON-FOUNDER BRCA1/2 MUTATION CARRIERS AMONG FAMILIAL BREAST CANCER CASES IN LATVIA. 8. DO RECURRENT MUTATIONS IN GENES OTHER THAN BRCA1/2, CHEK2 AND PALB2 PLAY IMPORTANT ROLE IN PREDISPOSITION TO BREAST CANCER IN POLISH WOMEN? 9. MISSENSE MUTATIONS OF NBS1 AND THE RISK OF BREAST AND PROSTATE CANCERS. 10. Constitutional methylation of BRCA1 gene in breast cancer. 11. PHARMACOGENETIC MODELS OF ADVERSE REACTIONS TO FAC CHEMOTHERAPY IN BREAST CANCER PATIENTS. 12. 3’UTR POLYMORPHISMS OF THE XMETS GENES AND ITS POTENTIAL EFFECTS ON THE FAC CHEMOTHERAPY IN BREAST CANCER PATIENTS. 13. TREATMENT DECISION SUPPORT FOR CANCER – VALUE OF GENETIC TESTING. 14. SIMILER 10-YEAR SURVIVAL IN BREAST CANCER WITH PATIENTS COMMON BRCA1 MUTATIONS IN POLAND AND LITHUANIA. 15. QUALITY OF LIFE OF BRCA1 CARRIERS AFTER PREVENTIVE ADNEXECTOMY. c) CZY LEKARZ POZ MOŻE BYĆ SKUTECZNYM DIAGNOSTĄ WCZESNYCH STANÓW ONKOLOGICZNYCH ? 17. The role of zinc concentration and alterations in genes associated with zinc metabolism in cancer- retrospective studies. 18. The role of iron concentration and alterations in genes associated with iron metabolism in cancer. 19. Copper as a marker of cancer risk. 20. Cadmium as a marker of cancer risk. 21. Arsenic as a marker of cancer risk. 22. Zinc as a marker of cancer risk. 23. Selenium as a marker of cancer risk. 24. Selina – clinical trial on lowering cancer risk in females with selenium deficiency. 25. Is CD36 a modifier of disease expression in familial adenomatous polyposis? 26. Contribution of copy number variations in familial adenomatous polyposis conditioning. 27. CLINICAL CHARACTERISTICS OF COLORECTAL CANCER IN PATIENTS DIAGNOSED WITH CHEK2 AND NOD2 GENE MUTATIONS. 28. Search for new genes of high risk of melanoma by whole exome sequencing. 29. A RETROSPECTIVE EVALUATION OF 512 RESULTS OF UROVYSION TEST APPLICATIONS. 30.FREQUENCY OF BRCA1 AND BRCA2 FOUNDER MUTATIONS AMONG OVARIAN CANCER PATIENTS FROM PODKARPACKIE VOIVODESHIP.